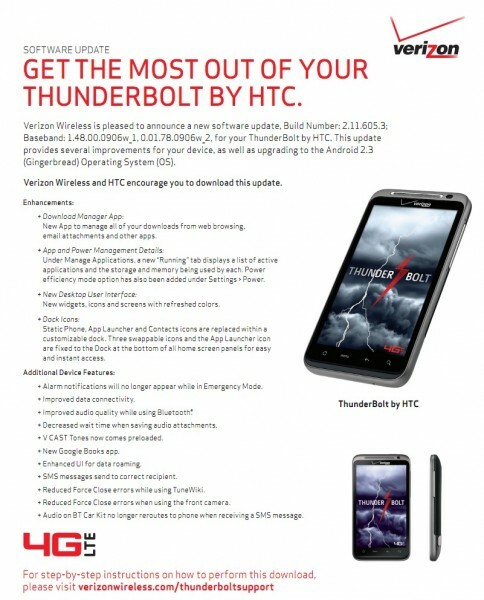 I’m not sure what to even say at this point, but HTC seems to be on track to hit their self-imposed September update for the Thunderbolt. The Gingerbread support document has gone live on Verizon’s site, which is usually a pretty good sign that we are just days away from rollout. As build 2.11.605.3 and weighing in at 146MB, this update includes a brand new dock and set of widgets, icons, and screens – things we weren’t exactly expecting (Sense 3.5?). Update: Ignore the “Dock Icons” section of the document. Verizon pulled that from a Moto Gingerbread update and has no idea what they are talking about. And if you don’t feel like waiting for this build to become available to pull, then you can manually update with an RUU that leaked over the weekend. Just know that this will wipe your phone completely clean, when the OTA update will actually keep everything in tact. 2. Drop the file onto the root of your SD card, meaning it is not in a folder. 3. Power down your device. 5. Your phone should recognize the file. Follow the on-screen instructions. 6. Once everything finishes, choose the option to reboot. Enjoy!